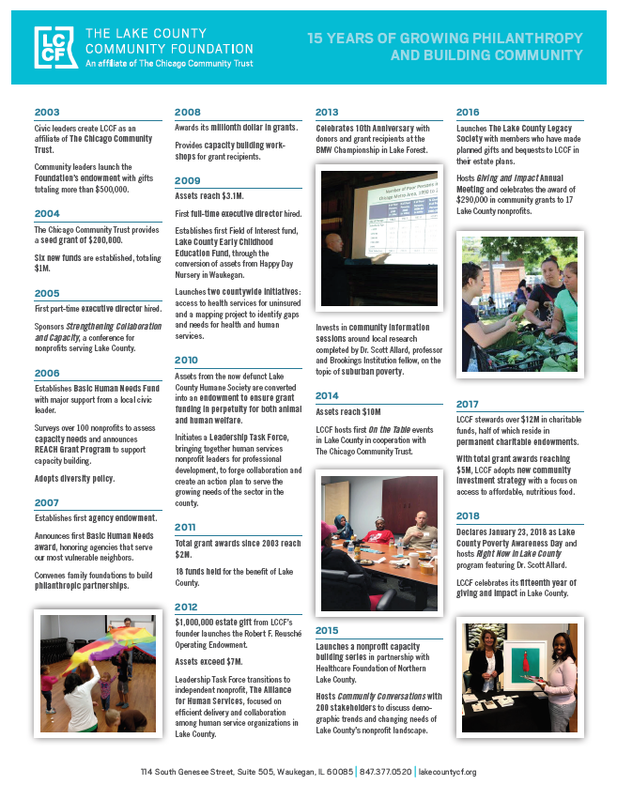 In 2003, a group of civic leaders approached The Chicago Community Trust about forming a community foundation in Lake County. This visionary group of county residents knew that resources would be required to help the community meet its growing needs and help provide a better life for future generations. At the time, the county’s population was approaching 685,000 with a poverty rate of just over five percent. In the subsequent years, the county’s population has grown to almost 704,000 and the poverty rate is approaching ten percent. Nevertheless, the Foundation, with the support of The Chicago Community Trust, remains true to its purpose of partnering with local residents, philanthropists, businesses and government to build permanent assets for our county.